Food served Mon–Fri 10.30am–4pm; Sat/Sun 10.30am–5.30pm. Tiny city-centre cafe serving one of life's simple pleasures: pork between bread. There are few things in life that offer such simple pleasure as pork between bread – whether that be a well-made bacon sandwich with real ketchup, a proper snapping hotdog with mustard, or a ham sandwich on granary bread. 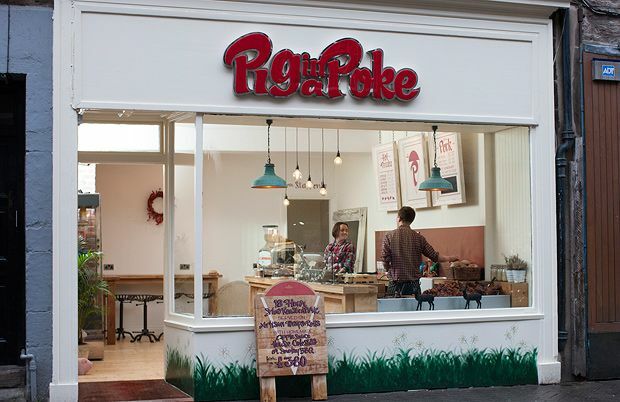 So it takes a bold enterprise to set its stall so completely on a single dish like Pig in a Poke does. And, with the explosion of places offering pulled pork seemingly everywhere these days, this relative newcomer with its simple hog roast offerings faces stiff competition. They succeed by doing exactly what you’d hope, delivering well-cooked meat, in a well-fired bun, with stuffing, crackling and apple sauce. Sure, you can have your pork served in other ways (in a wrap, panini or even on its own for the carb conscious) and with a host of other condiments, but why bother? As with many simple joys in life, the original way is still the best.